Our church is experiencing a flurry of new babies and I’m on the team that delivers meals to new mamas! I adore getting to see the tiny humans when I drop off the meal and I LOVE getting to serve new moms in this way. A few weeks ago, I had the privilege of taking a meal to a family I hadn’t met who just had their first little girl…a fiery little red head. She was so sweet and snuggly! I was making a giant pot of chili already for our family and ended up doubling up so I could make this for them to enjoy…a few times over! Another thing I always do when taking a meal to a new family is take all disposable plates, spoons, etc. so they don’t have to do the dishes! FTW!!! Note: This recipe is written for 2 9×13 inch sized baking dishes or pans. Prepare the slow cooker chili. About an 45 minutes before you need to deliver it or serve it…cook the pasta as directed in a saucepan, to al dente. The pasta will soak up some of the liquid from the chili when it bakes, so don’t overboil the pasta! 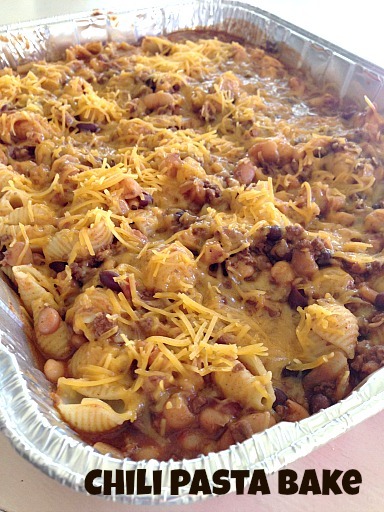 Mix together the cooked chili and the cooked pasta in 2 baking dishes, top with about a cup of shredded cheese. Bake in the preheated oven for about 20 minutes, or until cheese has melted. Serve (or deliver) the Chili Pasta Bake with a veggie or simple salad kit. I would love to make this recipe. It looks delicious. How well does this freeze? I’m trying to start cooking my meals ahead of time. I’m getting ready to go back to school and being able to cook certain meals and freeze them would make things a lot easier. This looks so delicious.Cant wait to try it.